DreamComfort Smart and Simple Playard - Connolly is rated 4.9 out of 5 by 14. From playtime to naptime, the Smart and Simple Playard is a safe space for everything your baby needs. Rest in the DreamCentre napper, relax in the playard, and get cleaned up on the changing table. The DreamCentre is the perfect place to snooze thanks to DreamComfort fabrics that allow more airflow so your baby can rest in a cooler and more comfortable space. 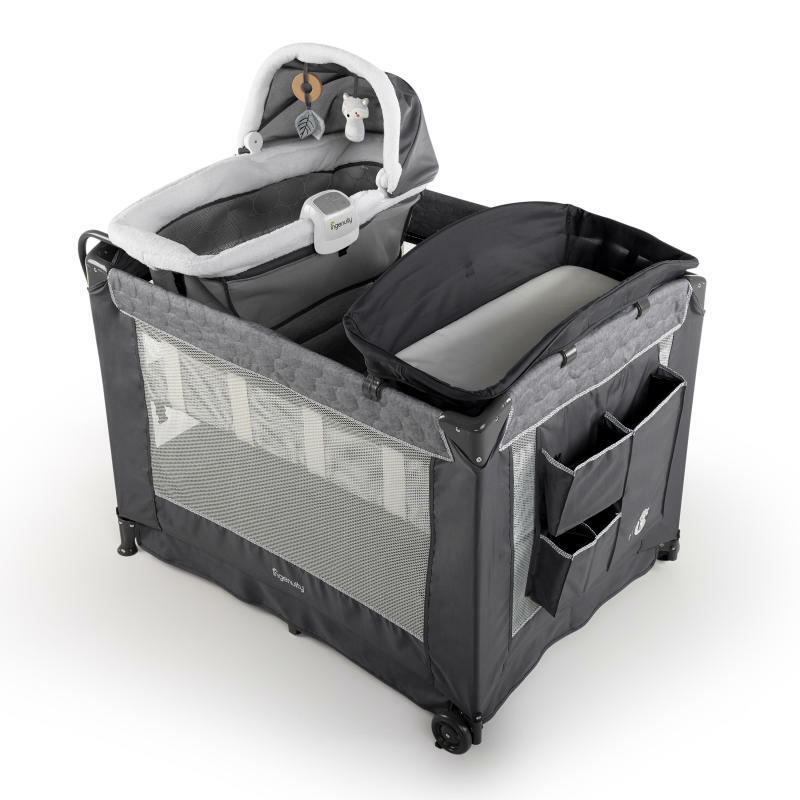 During play time, the transparent mesh panels make sure your baby stays in sight. The elevated changing table makes diaper changes more comfortable for both you and baby, and it flips easily out of the way when not in use. Designed to keep everything you need in one place, there are side storage pockets to keep necessities within reach. This playard easily folds in half when it’s time to pack up. You can quickly collapse and go without removing the bassinet. Wheels help move the Playard from room to room, and there’s a travel bag included for longer transports. When you need some hands-free moments, you can rely on the Smart and Simple Playard from Ingenuity to hold your baby safe and close. Rated 4 out of 5 by QueenOfSmiths from Sturdy, Simple To Use I needed a playard that was easy to set up and take down, and I am happy with this one! It is a little bit heavy, as all playards seem to be, but it has a sturdy frame and truly is easy to take down and set up. I also really appreciate that it is so easy to clean! Rated 5 out of 5 by Kjo1021 from Perfect With all my children, I have used a playpen to do a lot of the caretaking for them. When I was able to try out this new playard I was very excited. First I will say that I love the design and how soft the fabric is. This was very simple to put up just as you would any playpen. I love the added bassinet on top and also a diaper changing area. I have use this now on a daily basis and have to say that I love it. The baby seems to be very comfortable and it makes caring for my child easier in certain areas of my home. I definitely recommend this product to any moms who is constantly on the go throughout her house but also wants to keep an eye on her child as well. Rated 5 out of 5 by TonyaV from Great Pack n Play I love the colors and design of this Play-yard. Super cute and is a great investment. Rated 5 out of 5 by Bree from Perfect! The Smart and Simple Playard was exactly just that. Very simple to set up and take apart after. I love the bassinet part and easy access to changing my baby. This definitely made my life much easier. Rated 5 out of 5 by Kreed from Love this This playard is great! So many features. The baby seems extremely comfortable in it which makes me happy. Very sturdy, great quality! Rated 5 out of 5 by CandyHBebe from Grows with child. Fantastic product for the price. Easy and fast assembly, clean lines goes well with all decor. Grows with child, we started off using the bassinet, then gradually grew into the crib. The fact that a changing station is also included is the icing on the cake. You cannot beat the price or find another product that does all of this for the cost. Highly recommend! Rated 5 out of 5 by momtomany from Beautiful Comfy Playard A playard is my number one necessity with a baby. This playard is perfect. It's very durable and sturdy and has a beautiful, stylish design. I love that it has a small bassinet and a changing table. The fabric in the bassinet is very soft and comfy. They both are easy to snap into the playard. Everything is removable so it's very easy to clean. There are storage pockets on the side - which are GREAT for diapers, wipes, burp clothes, etc. There is a music/light piece that snaps on any side with adjustable volume. It's very easy to set up and it's very easy to collapse and store in the storage bag. The mattress can be set at mid-height or moved to the bottom as baby grows. I love that the middle mattress holder has a zipper. Overall I am very happy with this product and would highly recommend! Rated 5 out of 5 by Beth6 from Everything in one! This play yard has everything you need all in one spot. A place to sleep, play and change diapers. The play yard is not too big and bulky either. Fits nicely in the living room without taking up too much space. We will be able to get a lot of use from this versatile product.